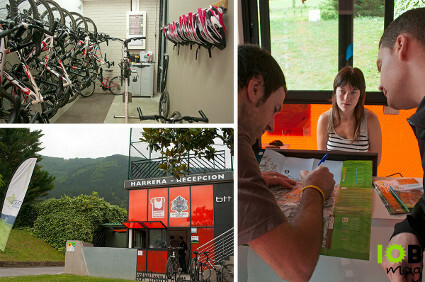 Debabarrena BTT Center has designed routes for both mountain biking experts as to the enjoyment of the entire family. These routes are divided by color (green, blue, red and black) and they each represent a difficulty. You also have at your disposal one of the best accommodation deals and Basque restaurants. Click to zoom experience buying natural products in the villages following one of the five gastronomic routes. This Euskadi Mountain Bike Centre is situated in the region of Debabarrena, halfway between Gipuzkoa and Bizkaia, just over 30 minutes of the three capitals of the C. A. Basque Country (Vitoria, Bilbao and San Sebastian). In point Mintxeta host, and offers bicycle rental, laundry and shower area, there is a pool area, picnic area, running track and gym among other facilities. The main feature of the region are the landscapes in contrasting, yet melt, the blue of the sea and the green of its mountains in the interior, constituting a real surprise for the visitor. In the tidal zone, approach routes visitors to a succession of beaches, coves and cliffs, with geological formations (flysch) considered one of the most important and worldwide reference.